The man is in a critical condition in hospital after the incident. He may lose his sight in both eyes. A 16-YEAR-OLD HAS been arrested after a fast food delivery driver was the victim of an acid attack in London on Thursday. While on Walpole Road, Walthamstow, the delivery driver was approached by two men on a scooter at around 6pm as he delivered a pizza to an address. They demanded he hand over his keys to his moped, and when he refused a struggle broke out. The suspects then produced a corrosive substance and sprayed him in the face. The victim, a 32-year-old man, was wearing a helmet with the visor was up and received substantial injuries to his eyes and face. The suspects left on their moped, leaving his behind. One wore a white helmet and the other wore a black one. 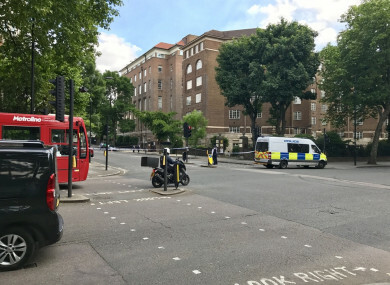 Officers from the Metropolitan Police attended the scene along with the London Ambulance Service and the London Fire Brigade. The victim was treated at the scene with water and taken to an east London hospital. He remains in hospital in a critical condition after inhaling the substance, and may lose the sight in both eyes. The 16-year-old male who was arrested last night is being held in custody on suspicion of grievous bodily harm. On Friday, a 14-year-old boy who was arrested also on suspicion of grievous bodily harm. He’s been released under investigation. This attack has left a man fighting for his life and with terrible eye injuries. This was an innocent man going about his work as a delivery driver, who may never see again. A second acid attack occurred shortly after the Walthamstow incident. At about 6.30pm, on Yarmouth Crescent in Tottenham, a second delivery driver was attacked with a corrosive substance. The 32-year-old man was approached by two men on a scooter who attempted to steal his moped. Acid was thrown in his face before the suspects left the scene on their moped. This man was also treated in hospital, but his injuries are not believed to be life-threatening or life-changing. It has not been established whether the two incidents are linked. Detective Henderson is appealing for those with information about either incident to contact the Met Police on 101 or contact via Twitter on @MetCC. If you don’t want to give your name, you can contact Crimestoppers 0800 555 111 or give information online at crimestoppers-uk.org. Email “Teenager (16) arrested after acid attack leaves delivery driver 'fighting for his life'”. Feedback on “Teenager (16) arrested after acid attack leaves delivery driver 'fighting for his life'”.